With the new Galaxy Forever Plan, new and existing Globe postpaid customers can avail of the latest Samsung Galaxy smartphone after just a year by first choosing their Galaxy Forever Plan of choice. Three plans are available for subscribers to choose from: Plan 1599 with a cash-out of P16,800; Plan 1999 with a cash-out of P14,800, and Plan 2499 with a cash-out of P12,800. Globe postpaid subscribers can now easily upgrade to the latest Samsung Galaxy smartphone year after year without having to complete the default 24-month contract period. At Plan 1999, subscribers get P3GB of GoSurf data plan, free 6-month subscription to Spotify Premium, choice of unlimited calls and texts to Globe/TM or unlimited texts to all networks, and additional monthly consumable for other services. For Plan 2499, subscribers get 5GB of GoSurf data plan, free 6-month subscription to Spotify Premium, unlimited calls to Globe mobile/landline, unlimited texts to all networks, and additional monthly consumable for other services. 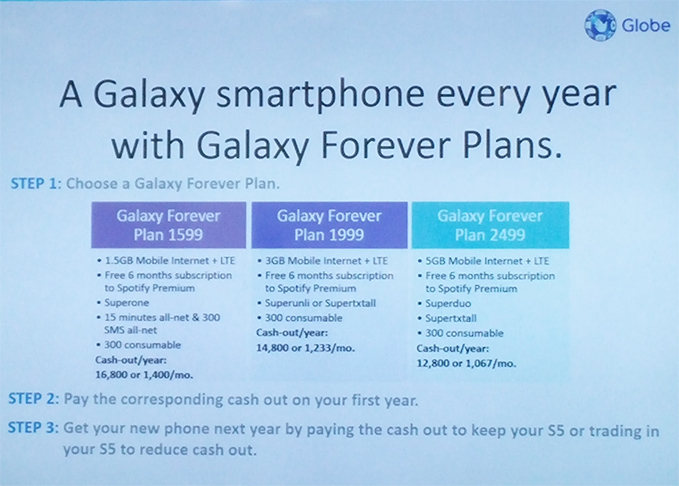 The Galaxy Forever plan will be available in Globe Stores nationwide or via the Globe Sales Hotline at 730-1010 from April 11-July 31, 2014. In addition to customizable postpaid plans, subscribers also get one-month free Gadget Care, the most comprehensive mobile phone protection program in the market today, as well as free access to Facebook until April 25, 2014. They also get the exclusive privilege to buy apps from the Samsung App Store and do in-app purchases, where amount will be charged to bill for postpaid customers or will be deducted from the prepaid load of prepaid customers. Above: Raul Macatangay, Vice President for Postpaid Business and Devices at Globe (left), and Coco Domingo, Product Marketing Head for Mobile Phones, Samsung Philippines. 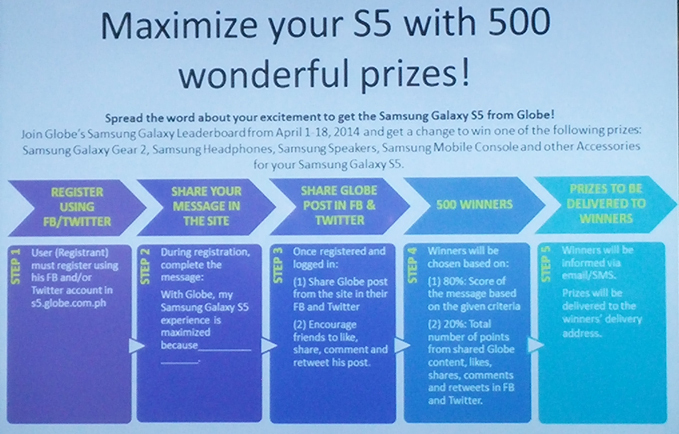 Globe is also giving away 500 prizes which include the Samsung Galaxy Gear 2 for its Galaxy Leaderboard Promo. Globe subscribers can enjoy the telco’s largest 4G network nationwide, giving them faster and more seamless connectivity while surfing on their mobile with the new GoSurf data plans bundled with free Spotify for access to over 30 million songs. 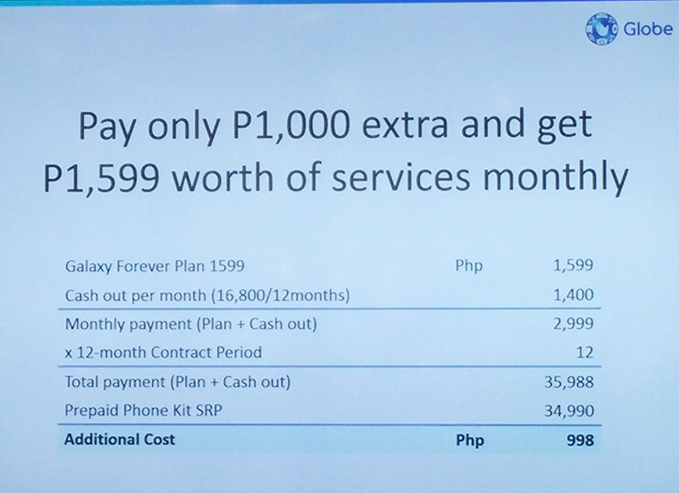 Find out more about the Galaxy Forever plan at www.globe.com.ph/galaxys5.